He will get us a great deal…not negotiate! Note: This column will contain spoilers. I also take a couple light shots at Trump. You’ve been warned. Air Force One is a true relic of the 1990s. The film was directed by Wolfgang Petersen (who was on a roll at the time, following In the Line of Fire and Outbreak) and came at the end of the Die Hard inspired “one man versus terrorists in an enclosed space” subgenre of action movies which gave us classic after classic throughout the late 1980s and 1990s. Air Force One is also from the action era before 9/11, an event which would forever change how filmmakers portrayed terrorist acts in popular entertainment. I’ve seen the movie a handful of times, but this was my first viewing since the late ‘90s and it’s a different experience in many ways. It’s hard to roll with a dumb action movie (and this movie is capital DUMB) that hinges on subplots including terrorists taking over a plane and traitors to a hostile power. However, those are unfair to hold against a movie that wasn’t intended to be political or controversial (it’s never mentioned if President James Marshall is a Democrat, Independent or Republican) in the first place. All we really gather from this President is that he has a conscience, is a regular guy who likes football, loves his family and won’t stand for terrorist guff. Political nuance and grey area need not apply. This is a popcorn movie through and through. 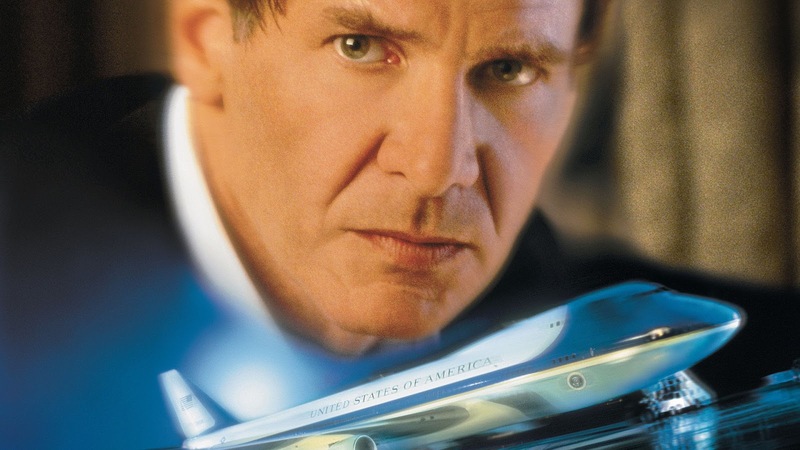 I don’t think Air Force One holds up as well as similar ‘90s actioners like Under Siege, Speed, Sudden Death, Die Hard 2 or With a Vengeance, etc. but it’s not without charm. 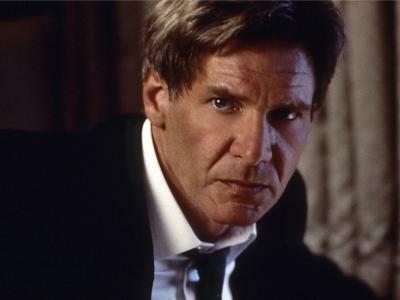 Harrison Ford is the whole show here in a role originally written for my boy Kevin Costner, who was too busy working on The Postman to take the role in Air Force One and went as far as suggesting Ford for the part. In other words, I will not condone any Kevin Costner bad mouthing in the comments for this article…or to my face, ever! Without Ford, Air Force One would be almost direct-to-video quality. It’s very professional looking crap, save for the visual effects, which are just crap (that plane crash at the end…like, are you serious?). Air Force One represents an interesting period in Harrison Ford’s career. It’s kind of the end of his “Harrison Ford is...” time period, by which I mean his involvement alone was worth hundreds of millions of dollars in box office. Look at the poster. It just says his name, who he’s playing and has a huge picture of his face. You are selling this movie on Harrison Ford and Harrison Ford alone. The poster doesn’t even explicitly state that the movie is in the action genre. 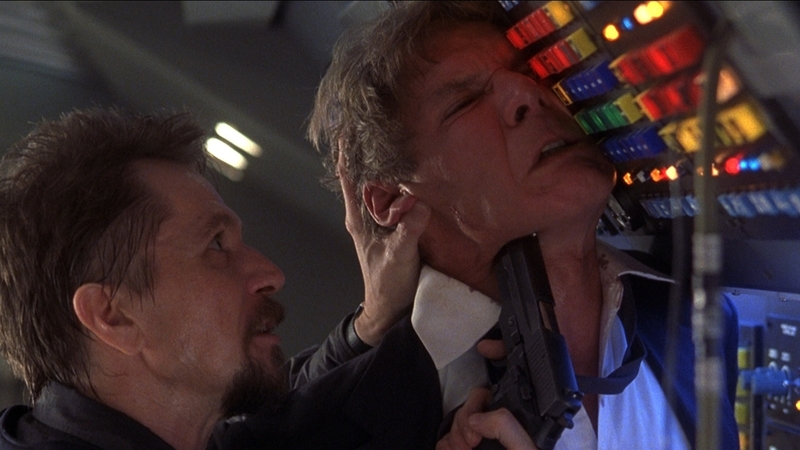 But, boy is it in the action genre, which is where Ford excels best. So, after 20 years, what is Air Force One like to watch? It’s diverting, but not much more and one of the lesser films of Harrison Ford’s “grown-up” movie period in the ‘90s, which featured his two efforts as Jack Ryan in Patriot Games and Clear and Present Danger as well as The Fugitive. Air Force One is a victim of having too many clichés and I’m talking about annoying ones like control rooms (Have they ever improved a movie? It’s just cheering and squabbling), sassy extras like the doubtful switchboard operator and characters that only exist to frustrate the audience with dubious agendas and counter-arguments. This movie is mired in those. Also, a plane isn’t a great setting for a thriller. They’re always the same because they have a set number of locations (cockpit, galley, luggage, main deck etc.) and the whole movie takes on a sterile vibe since you’re chilling in a pressurized tube. To end on a positive note, I’d like to point out two famous fans of the film: Bill Clinton (who screened the movie in the White House multiple times during his Presidency) and the current President, who was quoted as saying “Harrison Ford on the plane…He stood up for America.” When Harrison Ford heard this his reply was perfect. “Donald, it was just a movie. Things like this don’t happen in real life.” Harrison Ford rules! Trump would be so conflicted about Gary Oldman he wouldn't know what to do. One on hand, he's Russian, which means he's Team Trump, so Trump loves him. On the other hand, he's a fake reporter, which means he's FAKE NEWS, so he hates him. In the end, he would just tell everyone he has bad feet and leave anyway. I do think it's fun to think about how our recent presidents would fare in such a situation tho. Trump and Clinton...no shot. Obama might take out Wishmaster before getting too winded to fight on. Bush may take out 1 or 2. George HW Bush tho, he'd end up with a necklace of ears. No mercy, no surrender. I think Biden would have tagged along on the refueling plane and took care of the rest of the baddies that Barack didn't manage himself. Joe Biden sliding down a gas line with his belt between 2 planes is the most cinematic image I can think of. Someone ask Eric England to put this in his next movie. "It’s never mentioned if President James Marshall is a Democrat, Independent or Republican in the first place. All we really gather from this President is that he has a conscience-"
The funniest GOP healthcare joke I've heard is that they'll give you 50 Tylenol at birth and you can ration them however you see fit for the rest of your life. There's no mention of Oliver Platt and Steven Seagal in this review, I notice. Could this have anything to do with the fact that both these men (yes, men, you feminazis. It's not a dirty word) happen to be conservatives? I rather think it might be. What is happening with internet people?! Holy hell, I'm starting to lose my mind. I was making a dumb joke, Chaybee. F This Movie is the best. Adam is gorgeous. I don't care if he's on the short side or Jewish or slightly balding. He's a stud and I love him. Cool. Went over my head. Apologies. It's really all our faults for not recognizing the famous comic stylings of Anonymous. I loved this film as a kid but last time I rewatched it..... yeah it doesn't hold up well. By far the biggest issue is it is so bogged down in "control room scenes". Everything with Glenn Close and Dean Stockwell is in no way interesting. Still, Gary Oldman kills it here. I so wanted Close and Stockwell to just knock all the papers and file folders off the table and make out.